May Day 2016 Protests. Thousands of protestors converged on downtown Los Angeles streets to protest immigration laws and Donald Trump. May 1, 2016. 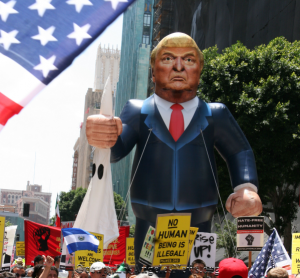 Thousands of protestors converged on downtown Los Angeles streets to protest immigration laws and Donald Trump the presumptive Republican Party’s presidential nominee. The protestors were focused on immigrants’ rights and workers’ rights. The crowd pulled a float which held a large plastic blow-up version of Donald Trump carrying a Ku Klux Klan hood in his right hand. The crowd repeatedly chanted “No KKK. No fascist USA. 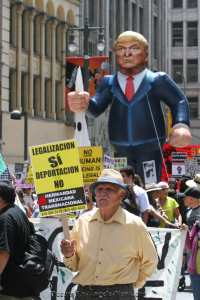 No Trump.” The May Day protests in Los Angeles were part of a worldwide series of civil disobedience scheduled for today. This entry was posted in Occupy Local News, Occupy National News and tagged may 1 2016, may day 2016. Bookmark the permalink.